All this running around ahead of Christmas works up quite an appetite. Pair that will the natural gluttony of the season and it can be handy to just reach for something sweet to give me a quick boost. I never thought I’d say this but I think I may have peaked too soon on the chocolate front and am starting to flag! 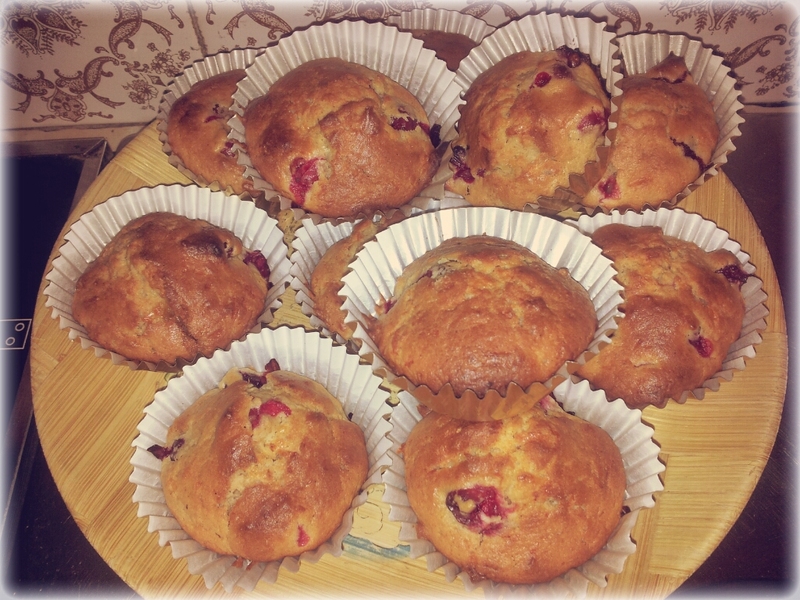 I came across a recipe for cheddar and cranberry cupcakes I thought I’d give it a go. I’m glad I did! Cranberries are everywhere at the moment and if you are a regular baker you’ll probably have the rest of the ingredients already in your larder or fridge. My first attempt came out pretty well so I’m hoping they’ll taste even better the more I make them. If you can’t find fresh cranberries you can use frozen ones – no need to thaw them first – although you’ll probably come across these easier once the season ends. The festive jewels add a tartness to this normally sweet treat and the cheese comes through more and more with each bite. Really tasty for a weekend breakfast or when you’re just craving something savoury. * In a large bowl combine your dry ingredients – flour, sugar, cheese, baking powder, bicarbonate of soda, salt and spices. Stir until well blended and make a well in the middle. * In a small bowl whisk together the buttermilk, yogurt and egg yolk. In another small bowl beat the egg white until soft peaks form. * Pour the buttermilk mixture into the well and, using a fork, stir just until the dry ingredients are moistened. Don’t overmix it – you ought to have a lumpy mixture. Then fold in the egg white and cranberries. You are best using a spoon or plastic spatula for this rather than the fork. * Spoon the batter into the holes or paper cases until each one is about 2/3 full, allowing the buns space to rise. Bake for around 20mins or until a skewer comes out clean. Another way to test if they are ready is by gently pressing your finger in on the middle of the bun. Your bun should bounce back. If it sinks they need to go back in the oven. * Transfer your buns to a wire rack and allow them to cool. Enjoy warm or cold. 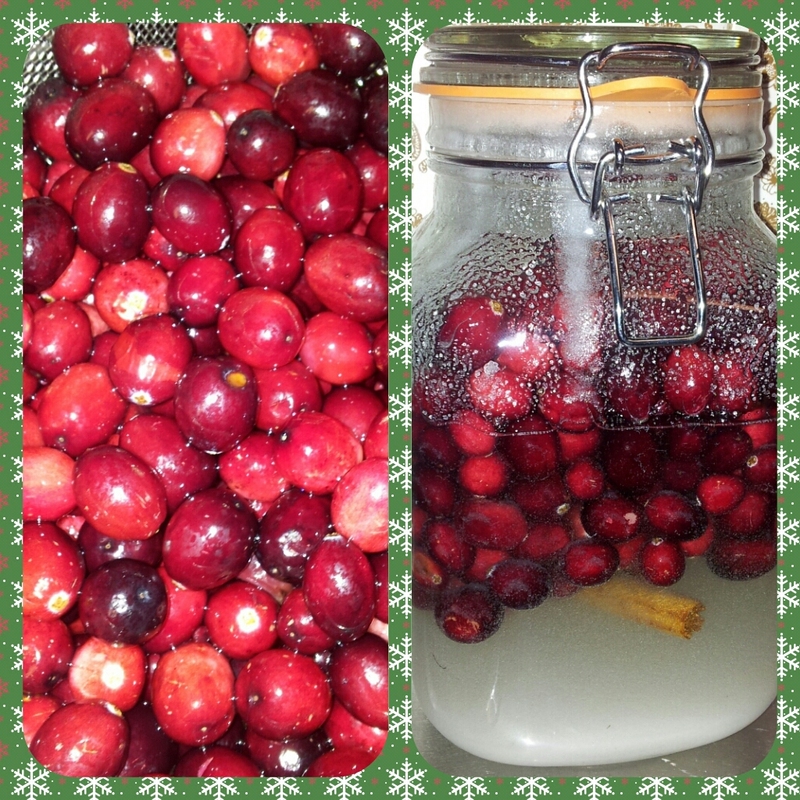 If you’ve cranberries left over why not make yourself a festive liqueur? Admittedly you can’t drink it straight away but if you’re planning to give up alcohol for January you can look forward to this tipple in February. All you need is 500g cranberries, 1 bottle of vodka, 2 cinnamon sticks, 500g sugar and this recipe.